Please read the attached letter regarding a case of chicken pox in the district. Winslow High School will not be collecting Senior Ads for the yearbook. 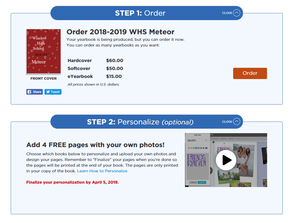 All ads can be submitted using the personalization tool on the ordering website. Parents can customize up to 4-pages free of charge. The deadline is April 5th, 2019. The WHS Counseling office has arranged for behavioral health presentations while Juniors take the weekday ACT. Please see the attached document for further information and call the counseling office if you have further questions. Get a jump on your FAFSA with the help of experts! See you Thursday, Oct. 18th in room 110 at 4:30 PM! !